James Gilchrist, circa 1910. 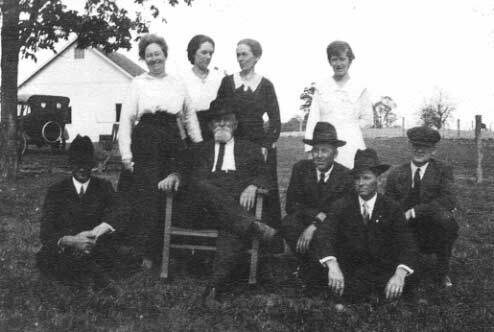 James Gilchrist with sons and daughters: Nellie, Laura, Bessie, Margaret, David, Roland, Logan, and Thomas. Circa 1916. James' wife Ann Ellen died in 1903. Model T in left background belonged to Thomas. West to Illinois. On the 12th day of May 1845 two families, namely, David Gilchrist, wife and sons, William and James [the future member of the 51st], and James Gilchrist, wife and daughter Jane left their home at Providence R. I. on a vessel for New York, enroute to their new home in the West. They came by way of Lake Michigan to Chicago, it consisting at that time mostly of log cabins. From Chicago they came by way of the canal to Peru, thence on the Illinois River to Pekin, Ill. At this place a rig was hired and they were driven to Delavan, where again they secured another liveryman and were driven to the home of Charles Philips, who at that time was living about a quarter of a mile north of the place where Henry Quisenberry now resides in Orvil Township. They landed at this place May 26, 1845, just 70 years ago. Suffice it to say however, while these people were strangers, they enjoyed immensely their hospitality for about two weeks until they made rails to construct their new home, David and family locating about a mile south of what is now Bethel Church, living in their rail house until a log cabin was built being completed about the first of October the same year. James and family, however, lived with the father of Chas. Philips until he purchased a log cabin and located one quarter mile west of the present home of D. J. Gilchrist. The farm of David Gilchrist had been purchased prior to his coming but he had never seen it before his arrival and no land had been broken. The country at that time was covered wtih grass and wild game was plentiful. He [David] was the first settler to build on what is known as the Delavan Prairie, building away from the timber. The two brothers worked together and broke the land, each breaking about ten acres for sod corn. Four horses were hitched to the front wheels of a wagon and the prairie plow fastened on behind, one doing the driving, the other the plowing while the corn was dropped in the furrow behind. Some land was broken in the fall and a small patch of wheat sown. David and family lived at this place for about 8 years when he purchased from Thomas Gilder 40 acres of land, now owned by his son James. He later purchased more land near here. A 40-acre field was purchased from Jerry Miller for 13 dollars per acre. Of the seven in the party James Gilchrist is the only surviving member. He now resides with his son David G. on the farm purchased by his father over 62 years ago, himself having lived on the place the past 33 years. Jane, the daughter of James and wife, who emigrated in the party, became the wife of James Houston, now deceased. With the Fifty-First Illinois. James signed up for service with the Fifty-First Illinois on October 10, 1861 at Atlanta (Logan County), Illinois. Like a number of his new regimental comrades James contracted the measles while in training at Camp Douglas, Chicago. He survived, while several men of the regiment did not. After that his health was fairly good, except for common wartime bouts with dysentery and diarrhea which resulted in brief stays in the regimental hospital. Thus, Gilchrist was nearly always available for duty—until, fighting Confederate enemies in the cedar brakes near Murfreesboro, Tennessee, he was wounded at the Battle of Stones River. At the time, he was in line of battle next to his childhood friend, Samuel Wilson, who was also wounded. Wilson and Gilchrist had been neighbors and school boys together and had enlisted together on the same day in October 1861. The two were wounded at nearly the same moment. Gilchrist was shot in the upper left arm and eventually was hospitalized in Nashville to recover. 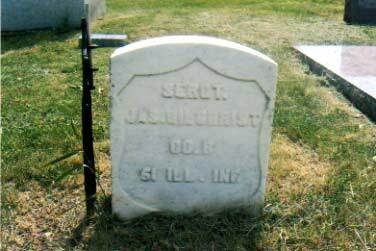 Samuel Wilson's wound was more serious; he was never able to return to the regiment, but he did survive and settled in Iroquois County after the war within a hundred miles of Gilchrist. In December, 1863, having come through long marches, many skirmishes, the horrific battles of Chickamauga and Missionary Ridge, and the wintry weeks at Strawberry Plains in East Tennessee, Gilchrist re-enlisted to serve for another three years (should the war last that long). On September 1, 1864, after the Atlanta Campaign of that year, he was promoted to corporal. At Franklin on November 30, 1864, he suffered numerous minor wounds. On March 16, 1865, he was promoted to sergeant. He was with the regiment to its last day in service in Texas in September 1865. After the War. James was not yet eighteen years old when he enlisted in the Fifty-First Illinois. When he was mustered out down in Texas on September 25, 1865, he had sixty-one years ahead of him. He returned to Illinois. He married his wife Ann Ellen Paton (born May 31, 1847) on March 1, 1866. They had ten children. 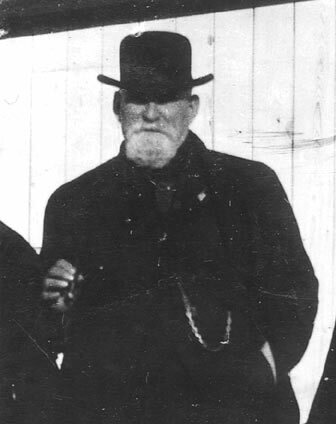 For six decades James tended his family and farmed the rich Illinois Gilchrist lands in Logan County and Ford County (where he lived from 1869 to 1877), including the land his father and uncle homesteaded in 1845. A number of men of the Fifty-First, some years after the war, started to meet periodically at regimental and company reunions, but Gilchrist, as he told his pension board, had "resided on a farm continually since he left the army and from his location and occupation been in no condition to keep up any acquaintanceship with his comrades in said regiment." The old Stones River wound bothered James some, and he eventually received government pension monies because of it, but James prospered and lived to a ripe old age in the midst of a large and happy family. One of James and Ann Ellen's children died in infancy; another, Jane, died in 1901. Ann Ellen died on November 11, 1903. James died on November 16, 1926. 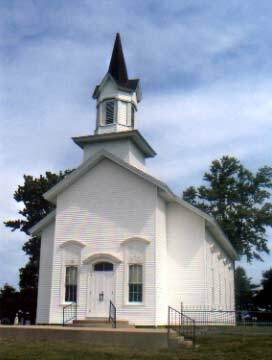 They were buried in the Bethel Church Cemetery, Orvil Township, Logan County, Illinois. 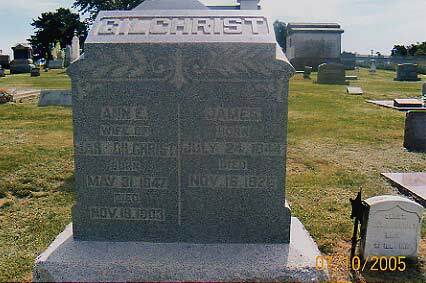 Pictures of the James and Ann Ellen Gilchrist grave at the Bethany Church Cemetery in Orvil Township, Logan County, Illinois. The church is shown elsewhere (above) on this page. James Gilchrist, Compiled Service Record, Records of the Adjutant General's Office, 1780's-1917, Record Group 94, National Archives and Records Administration, Washington, D.C.
James Gilchrist, Pension File, Records of the Veterans Administration, Record Group 15, National Archives and Records Administration, Washington, D.C.
United States of America, Bureau of the Census. Eighth Census of the United States, 1860. Washington, D.C. Many thanks to Gilchrist's great grandson James Thomas of Havana, Illinois for family information, newspaper articles, obituaries, and photographs.